There is this thing called National Novel Writing Month or NaNoWriMo that occurs every year in November. It’s a “contest” to write 50,000 words in one month. So I did it. I wrote more than 50,000 words in a month. The key to attaining any goal is consistency and practice. I have to admit. This month I didn’t know what half the plot of my novel was. I knew who the characters were (kind of–I only had half of their names picked out) and I knew there were going to be some sort of demons… and that was about it. AND what kept me going, what kept me from getting “stuck” was to JUST WRITE. Sit down in front of my computer and click keys. Even if that meant I was just musing about my plot and characters or actually moving my characters through the story as long as I was putting words to the page I was making progress. You can’t finish a novel if you’re not willing to put in consistent daily work to finish it. –I would know, I have a silly little unfinished novel from middle school sitting in my bedroom at my parent’s house. This is what we’d call a Novel Aesthetic. Basically a collection of photos I found that I feel describe my characters and my novel. Same Rumple. I don’t know what I did to my main characters either, I blame it on the wine I drank while writing. So my goal has been to fill that with writing. I’ve written/almost finished two whole novels in my first two months. (Now back to the grindstone. I’m going to Berlin… tomorrow, so I’ve got some work to do!) Just wanted to give a tiny update to remind everyone I’m alive! What was Emily doing all November? Truth? I was in my lovely Parisian apartment… writing. Writing like a madman… or a novelist. This past month I participated in NaNoWriMo (National Novel Writing Month) If you haven’t heard of it, check out the website. It’s basically a personal contest/challenge to write 50,000 words in a month. The organization has been running this “contest” for over a decade and I’ve been wanting to participate for the last several years but never found the time, until now. My progress through the month. I hit 50,000 on the 26th! Did it take a lot of time? Of course. I usually spent at least 2 hours a night writing, but to call it a waste of time would be wrong. I wrote a novel in Paris. Writing a novel has always been something I’ve wanted to do and something I have even attempted several times. I have word documents full of story ideas and even a 35,000 word attempt from back in middle school. (For all you non-Americans when I was like 12) So when I say I’ve wanted to write a novel my entire life, I mean it. And writing a novel in Paris was a bucket list item too tempting to be missed. Paris, the same city where Victor Hugo, Alexandre Dumas, Oscar Wilde, Hemingway, F. Scott Fitzgerald, Gertrude Stein, George Orwell were all inspired and wrote their timeless masterpieces. So November 3rd, I sat down, already three days late and started writing. 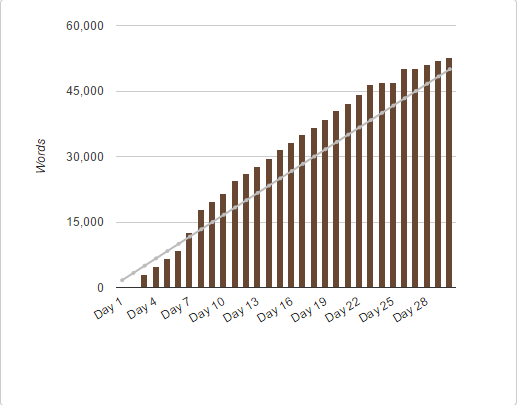 23 days later I’d broken the goal of 50,000 words and I took a little break. Then I continued writing slowly and I had reached the last scene of my novel when I had to leave to catch a plane to Prague. I don’t think I’ve ever been more upset to travel. So. Close. Just one more hour! Prague was absolutely amazing (blog post to come) but as soon as I returned (and had a nice long nap) I sat down to finish the last few scene of my still unnamed work full of vampires, werewolves, witches, and one very strange tattoo. Not in the slightest. It’s a first draft full of mistakes and I spent the entire month ignoring my inner editor and writing down things I will need to go back and change, but only after I finished my first draft. I spent most of the month in my room as I said earlier, but don’t worry because I still worked in a day trip to Versailles, a comedic play, and the Christmas markets of Paris. So I wasn’t a total shut in. I WROTE A NOVEL GUYS. AN ACTUAL NOVEL.